Order your own copy of Del Mar Looking Back. Matilda Mary Jones Shefeld Treahy was born in San Francisco, California in about 1865. Her parents were Eliza Bridges Jones McKellar and Henry Jones. According to the Superior Court of San Diego Probate records she was called Mamie. Her mother, Eliza, claimed in her Civil War widow's pension application that on May 15, 1865, her father, Henry Jones, set sail for Australia to prospect for gold. Her mother received one letter from him and he was never heard from again. 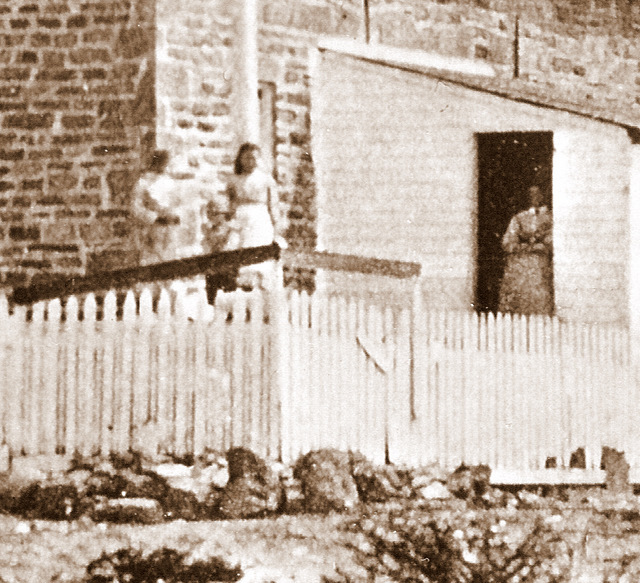 From November 23, 1867 to May 20, 1871, Eliza and Matilda lived with John Jenkins at the Old Point Loma Lighthouse. At the time of the 1870 census, she was listed as Matilda Jenkins age 4. Her mother, Eliza, married Ellar McKellar on May 30, 1871 when Matilda was about five years old. After that, Matilda was raised at their stagecoach stop called Cocktail Springs near Del Mar, California. She attended school in the San Dieguito schoolhouse. Davidson in Some Place Names in San Diego County quotes a news item dated August 7, 1875 that said the San Dieguito schoolhouse had been moved to Cocktail Springs. The 1880 census of the school lists Matilda McKellar. The school was built in 1872, but not finished until 1880. It was a small frame building with a flagpole in front. On May 14, 1880, the ladies of the area held a ball at the school to help pay for finishing it. Matilda was listed in the 1880 census. She was living in the San Dieguito Township with her mother, Eliza, and her step-father, Ellar. She was sixteen years old and was still at school. Her name was listed as Matilda McKellar. In 1881 Matilda married for the first time. Ewing describes Matilda's first wedding in Del Mar Looking Back. Eliza had been married before and had a daughter Matilda, whose wedding in 1881 to Tom Smith [sic?] was the occasion for a big party at the McKellar station. The local newspaper wrote of it at the time: "We understand it was a lively occasion, and the attendants had a royal good time, chasing the fleeting hours on the light fantastic until the clarion notes of chanticleer announced the rising sun, who struck his shining 'mug' laughingly above the eastern horizon." According to the marriage certificate, she married Henry F. Shefeld on July 18, 1881. She was only sixteen at the time and her mother had to give permission for the marriage. The marriage was performed by Frank Peterson, J.P. (a married farmer who lived in San Dieguito and was from Missouri). The witnesses were Stephen F. Wood (a laborer from Missouri who lived in San Dieguito with the Smith family) and Thomas W. Adams (a merchant from Texas who lived in San Dieguito). The marriage documents indicate that Henry was born about 1859 in Massachusetts. In the 1880 census, there was a Henry T. Smith living nearby in San Pasqual. Henry Smith was born in Massachusetts in 1859. In 1889 Henry Sheffield registered to vote in San Francisco. He was a 31 year old driver born in Massachusetts. Between 1881 and 1884 something happened to Henry and she married John Patrick Treahy. The marriage was not recorded in San Diego. Her first daughter, Nellie Treahy, was born in 1884 at Cocktail Springs. In the five birth announcements of her children in the newspaper, she was listed only as the "wife of J.P. Treahy." Matilda and Patrick's children and life together are described in detail in the section on John and Matilda Treahy. In 1885, Matilda's stepfather, Ellar, died. Matilda owned some land of her own. According to probate records, Matilda owned lot 36 in block 129 of Mannasse and Schiller's Addition and lot 2, section 19, township 14 south, range 3 west, San Bernardino Meridian which was 41 acres. According to oral family history, she ran off with a traveling musician and left the children and her husband. According to Nellie Treahy Long, she was shot in a dance hall in Arizona by the man she ran off with because she danced with someone else. According to Ewing "Matilda ran off with a young Englishman and was never heard of again." Her granddaughter, Jessie Long Finkenkeller wrote that her mother, Nellie, had said that Matilda left when Nellie was eleven years old. If she left when Nellie was eleven, that would be 1895. Her grandson, Jack Treahy, remembered his father saying that the last time the children saw their mother was at the old National City Hotel. The family story seems to be supported by existing documents. She moved to Tucson, Pima County, Arizona and died in Nogales, Sonora, Mexico according to a sworn statement from William Armine Julian. W.A. Julian, being duly sworn, deposes and says: I am of the age of 45 years. I was well acquainted with Mrs. Matilda Mary Treahy, formerly the wife of John P. Treahy, deceased. She is dead. I knew her when she resided in San Diego, California and afterwards in the town of Tucson, Arizona. I knew her at the time of her death. She died about the year 1899 at Nogales, south of Tucson, in Mexico, and south of the international boundary line. I was then living at Tucson. My residence at the present time is in Tucson, Arizona and I am here in San Diego on a visit. Photo taken at the ligthouse when Matilda lived there. She is possibly the girl in the foreground. Some years ago, prior to World War II, the Times Advocate of Escondido published a story written by one of their older residents, a retired school teacher. In her yough, Mrs. Steven (Huffner) Wood had been a teacher in the new San Elijo school disctrict. As one of the first teachers in the area, she lived on the McKinnon ranch in what is now Cardiff. She describes Cardiff, the way of life thirty years before the community was named. In her narrative she mentions "Weed," this stage stop later became Del Mar. this was before Encinitas was subdivided although Las Encinitas Rancho was in existence. . .
"I graduated from San Jose State Normal in June 1881. A classmate, Ida Carpenter, asked me if I would like to go to San Diego county to teach my first school, as she had a friend there who was acquinted with Superintendent Hitchcock, I was anxious to do so. My parents agreed to the plan provided my sister, Catherine Huffner, then teaching in Contra Costa county, also would go. The proposition pleased her so arrangements were made and, accompanied by my father who wanted to see us safely there, we started. We traveled from San Francisco to San Diego on the steamer Ancon. On reaching San Diego we docked at the wharf at the foot of Fifth Street and stopped for the night at the Horton House, at that time called the Hadley House, being managed by a man by the name of Hadley. The next day we took the stage for our respective schools which were in adjoining districts. Miss Carpenter had secured the San Dieguito school, my sister the Hope district and I the Sn Elijo, a new district. The stage stopped at Weed, the station near the San Dieguito store to change horses. It was kept by a family named McKellar. The coach continued northword until we reached the home of Frank Peterson, one of the trustees of my district, which was almost a mile and a half from the school. There I left the stage. I was told that after I got out one of the passengers, a traveling salesman, remarked, "God pity the poor girl if she has to stay in this place long." William Armine (W. A.) Julian was born in Brown's Valley near the Sweet Vengeance mine in Yuba County, California on September 10, 1865. His father was a metal worker who made pipe for the hydraulic miners. When he was three, he moved with his family, A. H. and Mary M. Swain Julian and Father Horton to San Diego to enter the plumbing and metal business. He lived in San Diego when it only had a population of 23. His father's business, which was established in 1868 was at 532 5th Avenue. There was a big fire in 1869 that destroyed the leading businesses. After that there was a big influx to New Town. He attended school in the little 'pink' school house on B Street. He worked for five years in the composing room of the San Diego Union. He married Margaret J. Clark in San Diego on July 16, 1886. He came to Tucson in 1899 and opened the W. A. Julian Company which eventually controlled 85% of the plumbing, heating and roofing business in Tucson. Julian served as a member of the Tucson Chamber of Commerce and was elected chairman in 1928. He ran for mayor in 1929 and served one term until 1931. He was one of the organizers of the Tucson Gun Club. He was active in the Elks Lodge, the Tucson Rodeo committee, the Masons and Old Fellows. He died on July 25, 1941.